The feature race on the final day of Glorious Goodwood is the Stewards’ Cup one of the most valuable sprint handicaps in the calendar. I think you want to be drawn middle to stands’ side and Spring Loaded (7/1 with BetVictor) looks sure to make a bold bid with Ryan Moore in the saddle from stall 19 although I just feel he is better at the minimum trip and his stamina might give way even over this easy six furlongs. Gifted Master (16s with BetVictor) is only 2lbs higher than when scoring at Newmarket back in the spring on fast ground and leading apprentice Jason Watson takes off a valuable 5lbs this afternoon. The hope is that Gifted Master can tow those drawn high into the race and I feel Tupi (3.40) can run a big race at 25/1 for Richard Hannon. The selection has not been at his best so far this term, but I hope he has the race run to suit and can run into a place (first five with BetVictor). Hochfeld (2.25) helped force too strong a gallop when failing to get home over two miles at Newbury last time and this return to 1m 6f will certainly suit Mark Johnston’s 4-y-old. The stable have won this corresponding race twice in the last three years and the Middleham handler saddles five of the 14-strong field. The selection is 14/1 with BetVictor and I hope Martin Harley does not get embroiled in a battle for the lead with My Reward. Stablemate Soldier In Action won this corresponding race 12 months ago and the booking of Silvester De Sousa suggests a big run is expected. Dee Ex Bee (3.00) finished runner up in the Derby but must bounce back after a moderate couple of moderate runs including when third in the Grand Prix De Paris at Longchamp on Bastille Day last month. He made a winning debut at this corresponding meeting 12 months ago and the hope is that he can get an easy lead in this 4-runner field. Sun Maiden was keen in the Ribblesdale Stakes at Ascot last time and she will have to be more amenable to restraint if she is to get home back at a-mile-and-a-half. The selection is 6/4 with BetVictor. Restive Spirit (4.50) went down by half a length to Naval Intelligence on his penultimate start and that form has already been franked with the winner subsequently scoring in listed company. The winner is now rated 107 and with that in mind Restive Spirit – who won a modest Ripon maiden last time - might be well treated off an opening mark of 93. Hyanna did us a favour when winning a moderate race at Epsom last time and a 5lbs rise looks harsh ion the fillies’ handicap at Newmarket. I am keen on the chances of Sir Michael Stoute’s Phantasmic (4.25) who finished runner up at Ascot last time beaten a neck by Maid Up. That filly finished second in a Goodwood Group 2 earlier in the week and Oisin Murphy takes over in the plate today. 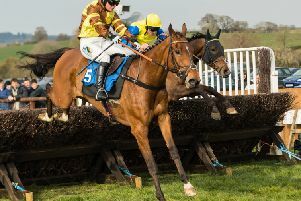 At Market Rasen on Sunday I hope to see Café Au Lait (2.35) maintain his recent improvement for Dan and Harry Skelton and land his hat-trick despite being raised 5lbs for his recent Ffos Las success. At Chester, I hope to see Major Jumbo (3.00) land the listed Queeensferry Stakes for Kevin Ryan from his plum draw in stall one. This 4-y-old has been running well in top class handicaps of late and this sharp track should trip the grey.